These four remarkable structures which cross the eastern channels into Scapa Flow were born out of serious defensive weakness which a German U-boat commander skilfully exploited just six weeks into World War II. Scapa Flow was ideally suited to serve as the wartime fleet anchorage for the Royal Navy in both World Wars. However, the four main channels on the eastern side of the Flow were known to be weak spots in its defence against enemy submarines and torpedo-carrying craft. In 1915, consideration was given to the building of permanent barriers, but in the event blockships were sunk instead. Most of these remain as rusting hulks and are today a major attraction for the world wide diving fraternity. After the first War, some of the original blockships were removed or shifted position, and their inadequacies were exposed in October 1939 when a German U-boat, U-47, commanded by Günther Prien, found a way round the blockships in Kirk or Holm Sound, the deepest and fastest-flowing of these channels, torpedoed the battleship HMS Royal Oak, with the loss of 833 lives, and escaped by the same route. Today the site of the Royal Oak, just off Scapa Beach, is a registered War Grave. Evocatively, 60 years later, on a calm day you can see a thin film of oil slick from the still bleeding wreck. This dramatic episode at the very start of World War II finally prompted the construction of permanent barriers across the four channels, authorised by Churchill himself after a visit in person in March 1940, hence their name. Site preparations commenced in May 1940, and during the summer of that year limited experiments were conducted on models in the Whitworth Engineering Laboratories at the University of Manchester under the direction of Professor A H Gibson and Dr Jack Allen. Not finally breaking the surfaces of the channels until 1942-1943, the barriers became recognised as causeways for potential civilian use, and a relaxed interpretation of the Geneva Convention by suggesting the barriers were being constructed as a civilian project allowed the labour force to be augmented substantially by Italian prisoners-of-war from early 1942 onwards. At its peak in 1943 numbers engaged in the operation reached about 2,000. Costing some £2 million, the works were effectively completed in September 1944, but were not officially opened until four days after VE Day. The contractors for this remarkable and pioneering feat of engineering and organisation were Balfour, Beatty & Co Ltd, the southern section of the southernmost barrier being sub-contracted to William Tawse & Co, Perth. Until 1942 the Resident Superintending Civil Engineer was E K Adamson, and from 1942 until completion it was G Gordon Nicol, whose notes and photographs preserved in the Orkney Archives in Kirkwall constitute an invaluable record of the work of construction. A special feature was the use of five aerial cableways, four electrically-driven, one steam powered, by John M Henderson & Co Ltd, Aberdeen. Nicknamed ‘Blondins’ after the French acrobat and tight-rope walker, Jean Blondin (1824-1897), famous for his high-wire crossings of the Niagara Falls, two of the cableways were paired across Kirk Sound, the deepest of the channels. The structure of the four barriers consists of a core of rubble bolsters cloaked by 5-ton concrete blocks below the water line. Except in the case of the less exposed Weddel Sound which is of 5-ton blocks throughout, these are in turn overlaid by 10-ton blocks, the outer skin being laid in ‘pell-mell’ fashion to break the force of the waves. The barriers measure some 2.3km in overall length, linking East Mainland to South Ronaldsay via the three islands (north-south) of Lamb Holm, Glims Holm and Burray. The widest and deepest channel was the northernmost, Kirk or Holm Sound between Mainland and Lamb Holm, where the foundations of what became No 1 Barrier were laid in fast-flowing tidal water up to 18m in depth. In total, the barriers absorbed about 250,000 tons of quarried rubble overlaid by some 66,000 concrete blocks from the casting yards at St Mary’s and on Burray. The sites of the accommodation camps, rubble quarries, the concrete blockyards and the associated railways are still traceable on the ground, and the chapel on Lamb Holm, cleverly wrought out of two Nissen huts, remains a powerful memorial to the Italian contribution. Another Italian chapel, associated with PoW Camp 34 on Burray, was demolished after the war. 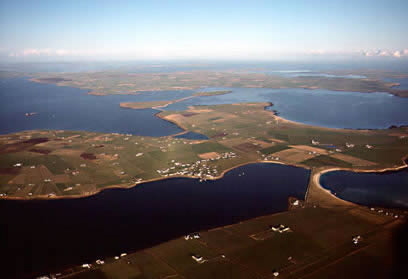 One of a ring of islands surrounding Scapa Flow, Burray is an irregularly shaped land area of just two and a quarter square miles (2231 acres), with a population of 360 persons (2001 census). The name comes from the Norse 'Borgarey', meaning 'Broch Island'. Burray is the third island in the chain linked by the Barriers, sandwiched between the East Mainland of Orkney and South Ronaldsay. 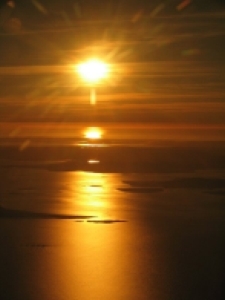 The island is separated from the mainland by Holm Sound, from South Ronaldsay by Water Sound and from the small island of Hunda to the west by Hunda Sound. The uninhabited island of Hunda off the west coast of Burray is joined by a smaller version of the Churchill Barriers, known as the "fifth barrier". The island is a breeding ground for several bird species, and has many seals. Permission must be obtained before visiting Hunda. The island has some pleasant coastal walks, and seals can often be seen basking on the rocks between the Bu and Burray Ness. Of archaeological interest are the ruins of a broch at Northfield and the remains of St Lawrence's Church. Some important finds have come from around Bu Sands and it is probable that this area is significantly important from an archaeological standpoint. 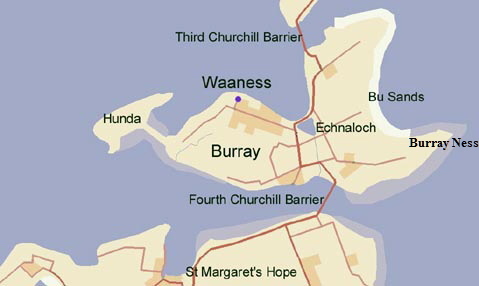 There is a bird sanctuary at Burray Ness on the eastern tip of the island. Along the East Coast, Bu Sands is a fine long sandy beach backed by dunes though somewhat despoiled by a commercial sand quarry and the newly erected community wind turbine. The POW Campo 34 was built here and if you ask locals you will find a hand carved original plaque on the entrance to the vanished POW site. Echnaloch Bay to the north west opens out into Scapa Flow. Echnaloch, separated from the bay by a narrow ayre is well known as a particularly good place to spot wildfowl. Burray Village with its boatyard and former herring store was a bustling centre for the herring fishing boats which were an important part of the local economy in the 19th century. To the north, across the third and second "barriers" are viewed the remains of the famous "block ships" and you will find the Italian Chapel nearby on Lamb Holm. The world famous Italian chapel is one of the major visitor attractions in Orkney. Just ten minutes drive to the south, over the fourth "barrier", along the A961 you arrive at St Margaret's Hope. From here the car ferry "Pentalina B" provides the quickest way across the Pentland Firth to Gills Bay in Caithness, sailing three times a day during the summer months, a journey time of about one hour. A further main visitor attraction is the Fossil Museum and Vintage centre at Viewforth which has a fascinating display of fossil fish from around Orkney and also exhibits fossils from other parts of the world. Burray is small and not particularly attractive, certainly not spectacular with a low lying and indistinct landscape. It is positioned between the Italian Chapel to the north and St.Margarets Hope to the south. Most local people visit Burray merely to drive through it. Most visitors will pass through looking at the Barriers, The Chapel or heading South. It is however, like much of Orkney, well worth visiting in its own right and getting to know much better.